A student who found Anglo Saxon jewellery of "national significance" said the discovery has made three years exploring the field worthwhile. Tom Lucking found a gold pendant inlaid with a profusion of garnets while metal detecting on farmland in 2014. The 7cm (2.8in) item was found in the grave of a female and has been described as one of the "most elaborate...ever found". It was declared treasure alongside other items at an inquest in Norwich. Why is Norfolk a treasure hunting hotspot? Mr Lucking, 23, a student from Felixstowe who is in his final year studying history at the University of East Anglia, said the discovery "had certainly given me a good dissertation project". He said: "It makes me pleased I've put time and effort in metal detecting in that field and it was worth going out into the cold and rain over the years to find those things." 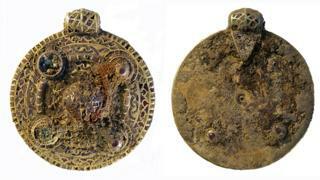 He unearthed the pendant whilst exploring a field near Diss, after initially detecting a bronze bowl. After the inquest on Monday, Mr Lucking said: "You can hope, but never really expect to find something like this. "It's not about the money value, it's about finding something that makes you re-think the whole history of an area." Julie Shoemark, finds officer for Norfolk, said the burial dates to the cusp of the early Christianisation of Anglo-Saxon England, around the middle of the 7th century AD. She said: "Within a century of this lady's death, burial practices had completely changed and people were being interred with no associated grave goods, as seen in the burials from Great Ryburgh. "She was undoubtedly a lady of some status in the community of East Anglia as the magnificent garnet inlaid pendant and associated grave goods demonstrate." Dr Andrew Rogerson, of the county's Heritage Environment Services, previously described the pendant as one of the "most elaborate...ever found". He said: "It would seem we have something of major significance." The British Museum report for the coroner listed a number of precious coins and jewellery found alongside the woman's skeleton. Mr Lucking has been metal detecting since he was 11-years-old. He said he will share proceeds from the sale with the owner of the land and his friend, Stuart Isaacs, who treasure hunts with him. Norwich Castle Museum is understood to be interested in buying the pendant after it is formally valued by the British Museum.